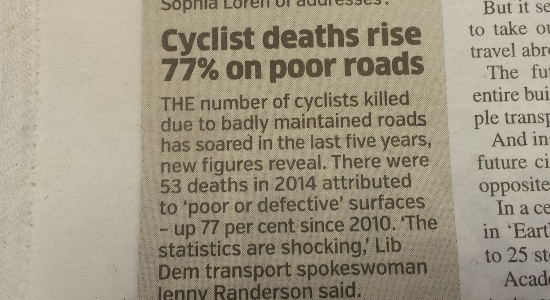 How many cyclists are hurt and killed on poor roads? 53 cyclists were killed in 2014 due to bad road conditions, up 77% since 2010. This is wrong. The figures refer to the number of cyclists killed or seriously injured (KSI) in this kind of road accident. This is wrong. The figures, released in response to a parliamentary question, refer to the number of cyclists killed or seriously injured (KSI) in reported road accidents on local roads, where an attending police officer judged that the road surface contributed towards the incident. But of those 53 cyclists, we don't know how many were killed, and how many were seriously injured. We’ve asked the Metro for a correction. Speed cameras: do they cause fewer accidents and road deaths?